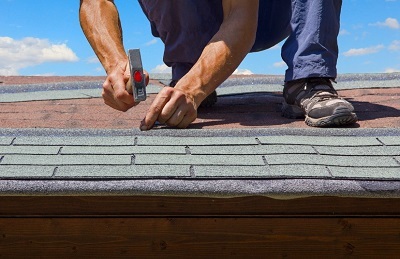 One of the most neglected parts of our home is the roof. Exterior house rendering and wooden window frames and doors get rubbed down and given a fresh coat of paint. Garden walls and fences are repaired and spruced up. Gutters and downpipes checked. Yet the poor old roof gets a cursory glance as we walk up the garden path. Until that is, we notice damp patches appearing on bedroom ceilings. The leak is highly unlikely to be above the damp patch. Unless the property is very old it will have a layer of roofing felt between the roof beams and tile battens. The water will run down the felt until it finds a small split or hole to drip through above the ceiling, and may well have been doing so for some time before it finally shows on your bedroom ceiling. Repairing the problem yourself is not necessarily the best way to go, especially if you live in a two or three bed semi. Firstly the safety factor, a fall from that height invariably ends in serious injury - or worse.